Co-created with his sister Carole and Erika Lewis, launching on Webtoon! This is the real deal. Let’s get that up front. Many actors have created projects for themselves in comics and then danced away, but John Barrowman has been consistently working with his sister Carole on both comics and YA novels for years. So when they bring in another friend, Erika Lewis, and create something new that could potentially star Barrowman in a film or TV series, it’s worth paying attention. First and foremost, they know storytelling, and they’re good at it. What makes this project even more forward-thinking is that this comic won’t be distributed to stores — at least not yet. Instead, it’s debuting on the webcomics platform WebToon. I’d say they’re making a big play, people, but that may be my own naivete — if their stats are accurate, they’ve been making a play for a while and I’ve just had my nose buried in hard copies of comics. At Comic-Con International, their party was in my hotel, and I ran into several up-and-coming creators who may not be as hot (yet) as they should be, but they’re hot. They’re good. And they’re looking seriously at WebToon. I already downloaded the app, and I’m going to look seriously at Acursian. 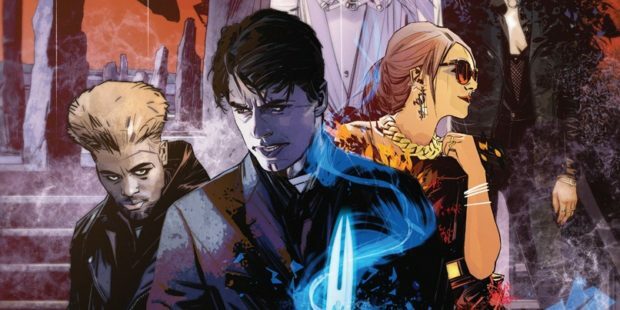 Formerly titled Cursed, Legendary Comics and Webtoon will debut the new imaginative comic series Acursian starring John Barrowman (“Doctor Who,” “Torchwood,” “Arrow”) next month. The series—rooted in Celtic lore in a unique fusion of mythic storytelling from co-creators John Barrowman, Carole Barrowman (“Torchwood”), and Erika Lewis (Game of Shadows and Firebrand: The Initiation of Natali Presano) with art by Beni Lobel and designs by Tommy Lee Edwards—will be available beginning at 11:59pm EST on Thursday, September 13. Readers can download the official Webtoon app by visiting the Apple App Store and Google Play. Acursian (an Old English word defined as one consigned to destruction, misery, or evil by a curse) stars John Barrowman as Charlie Stewart who, on the eve of an important birthday, falls victim to an ancient Celtic curse. Stewart seemed to have it all: the big house, the fast car, the beautiful family, and a high-power career at a leading criminal law firm, but overnight finds everything spiraling out of control as his perfect life becomes a disaster zone of chaos and calamity. Every decision he makes, every relationship he has, every choice he’s given is doomed to fail spectacularly, no matter what he does. Embarking on a quest for the truth behind the supernatural forces re-writing his destiny, Charlie discovers that his ancestor Bonnie Prince Charlie made a deal with the ruthless Celtic God of War, Bregon. In return for the Bonnie Prince’s victory at the battle of Culloden, Bregon demanded the prince steal three magical talismans from Bregon’s own sisters. These sisters cursed the entire Stewart bloodline and now Charlie must settle a centuries-long family squabble among gods in order to get his own family back. Real life and ancient legend collide in unexpected ways as Charlie battles across this world and opens up realms of time and mystery that no mortal was ever meant to see. 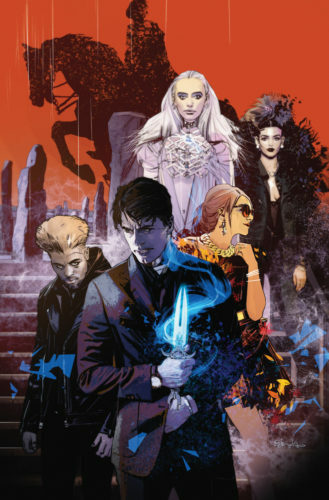 “We’re beyond excited to continue our partnership with Legendary and can’t wait for our readers to experience the world of Acursian that John, Carole, Erika, and Beni are creating,” said Webtoon Head of Content Tom Akel. Born in Glasgow, Scotland and raised in Illinois, John Barrowman is a unique talent in the entertainment industry on both sides of the Atlantic—he sings, he dances, he acts, he presents, he judges. His most famous television role is undoubtedly that of sci-fi hero Captain Jack Harkness, whose first appearance in the revamped “Doctor Who” on BBC1 created such an impact that he was given his own spin-off series “Torchwood.” John also played Malcolm Merlyn (aka The Dark Archer) in the hit American CW drama series “Arrow,” based on the Green Arrow comic books. John’s Merlyn appeared regularly in the CW’s “The Flash” and “Legends of Tomorrow.” He also played a guest-starring role in the CW’s hit historical drama “Reign” and ABC’s American political drama “Scandal” and has hosted and produced many UK-based series for the BBC and Channel 4, as well as ABC’s “Sing Your Face Off.” On the big screen, John has appeared in Zero Dark Thirty, All Stars, The Producers, De-Lovely, and the cult classic Megalodon: Shark Attack 3. John’s prolific stage career includes roles as the leading man in musical theatre in many West End and Broadway shows including: Sunset Boulevard, Miss Saigon, The Phantom of The Opera, Anything Goes, Putting It Together, and Sam Mendes’ premiere production of The Fix, which garnered John an Olivier Award nomination as “Best Actor in a Musical.” In his thirty-year career, one of John’s proudest career accomplishments was being awarded the MBE for his services to entertainment and charity by Her Majesty the Queen and the British Government. Erika Lewis is their bossy friend. Erika first collaborated with the bossy Barrowman siblings when she was producing G4’s “Attack of The Show!” and John was presenting. 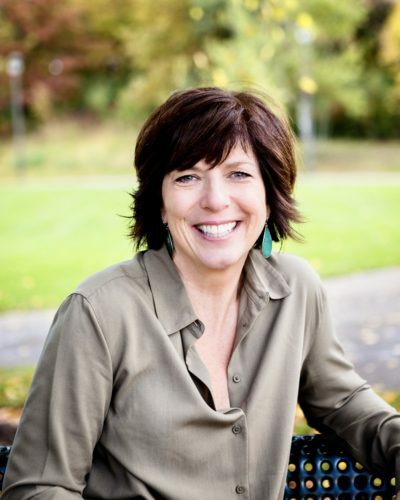 She graduated from Vanderbilt University and went on to earn an Advanced Certificate in Creative Writing from Stony Brook University. Erika is the author of Firebrand with Legendary Comics, The 49th Key from Heavy Metal, and Game of Shadows from Tor Books. Along with her writing and her producing, Erika has also launched the careers of a number of popular television stars.